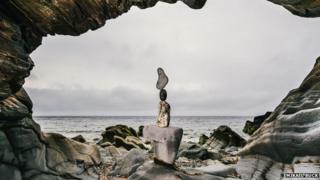 A rock-balancing artist has turned to the Isle of Man to showcase his gravity-defying creations. Adrian Gray, 54, from Dorset spent a week on the island last month with photographer Mikael Buck creating the unusual sculptures. He was commissioned by the Isle of Man government after they saw his work on the Channel 4 programme, Grand Designs. Mr Gray said it has taken "thousands of hours" to perfect his skill which he insists involves balance alone. Image caption The former surfer said it has taken "thousands of hours" to perfect his skill. The former expedition leader said he perfected his technique after becoming ill. He said: "I spent hours wandering along the beach and began balancing stones as a kind of therapy. "This year, I was invited to exhibit at the Chelsea flower show - I have been inundated." "I want people to be left open-mouthed by my work and the Isle of Man provided a stunning backdrop." Mr Gray said he scoured the island to find the perfect rocks and locations in which to balance them. The locations included beaches, glens and even the Isle of Man TT course. He said each sculpture is a unique challenge which involves understanding "the rock's individual weight distribution, shape and interaction." All but one of Mr Gray's free standing sculptures were removed after being photographed for health and safety reasons. The sole exception has been turned into a permanent statue in the meerkat enclosure at Curraghs Wildlife Park in the north of the island. Head of Isle of Man Tourism, Angela Byrne said: "The Isle of Man has such a range of stunning beauty spots that we wanted to bring attention to the selection available in a new and quirky way".